logo done by apricot :: send your logos to us and be a popstar ! Cool objects and nice logo. Like it. nice logo design and glow effect. program running in background but nothing. no error message :\ is there a special config to have ? nice cracktro & good tune. Not bad. Yet I can't find anything that I really like about it, sorry. Nice looking. Yey, objects good, spikeballs rulez!!! ppl using w98se in 2005 should be shot! and ppl who think its 2005 should be shot too!!! Nice font, good lights, not enuf FPS (here). Simple but nice. Why do you run it in win95 compatibility? ikstar > because i tried without the win95 compatibility and had the process in background. Nice flat shading effect, though ugly scroller, ugly syncs, bland music and lack of design subtract a bit from that. wow, impressive lack of coherence there, dudes. MinZ : try to install the last directX version. That should help. Or maybe update your Graphic Card drivers? I dont know. 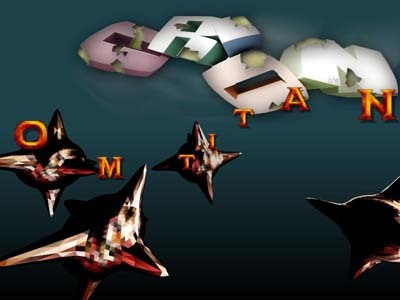 No offense but why all the gfx for this intro are credited to Bull/Titan in the nfo when the fonts are actually ripped from the Mindbomb Demo (Atari) and were made by Spaz / The Lost Boys. Hardly anything special. I didn't think that someone would still use the Megadeth font in 2006. :) Not a bad intro though. Crap. As always from Titan. page created in 0.080075 seconds with 15 queries.